Festival parking will be available only at designated lots for a fee of $5 per car. A free shuttle service will take festival-goers to and from Brow Park and the former Mentone Springs Hotel site, with stops along the way. Shuttles will run continuously throughout the day (8:30–6 on Saturday; 8:30–5 on Sunday). There will be no parking allowed on CR 89 or Cutler Avenue. Please respect the homeowners and businesses on these roads. 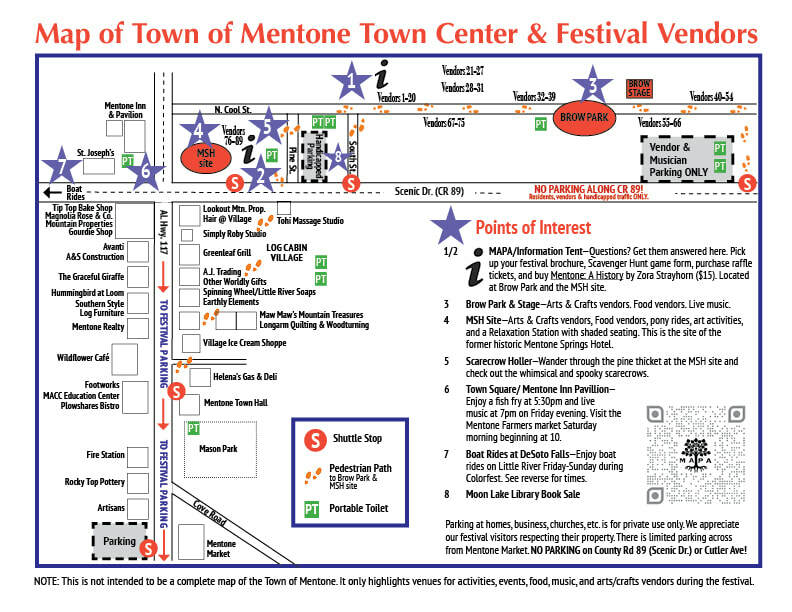 Watch for directional signs as you approach Mentone. Brow Park—County Road 89 at N. Cool St.
County Road 89 at South St.
Sidewalk across from the Mentone Market, west of Douglas St. Parking at Brow Park will be for vendors and musicians only and parking at County Road 89 and South Street will be only for handicapped and volunteers. at Brow Park and the hotel site.